Hence, they were good and lasted all of about two minutes. At least I got a photograph before the rest were snatched off the tray. Turn the grill to medium high. Coat the zucchini slices with olive oil, a sprinkle of garlic powder, salt and freshly cracked pepper. Grill on both sides just until light grill marks form. Set aside. Salt and pepper the tomato slices. Set aside. On a baguette slice spread a semi thick layer of hummus. Top with spinach leaves, a tomato slice, a zucchini slice, and a couple small red onions. Repeat with the remaining sandwiches. Top with another slice of bread if desired. Notes: I made my own red pepper hummus. Someday I’ll write the recipe down, but to me hummus is like peanut butter and jelly. I just throw a little of this in, and a little of that in, until it tastes “right”. This drives Dishboy Scott’s scientific side insane, which makes my ornery side very happy. This looks like a great summer dish-straight from the Farmer's Market! I can't wait until you post your red pepper hummus recipe!! 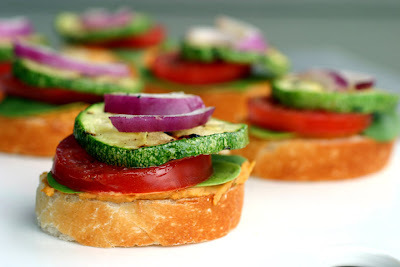 Your veggie sliders are incredible and I can't wait to make them!! How long in advance do you think you can grill the zucchini? Thanks for sharing. These look refreshing. Your photo could be an advertisement for healthy eating. These are adorable...and they sound great! I will try to write down the hummus recipe, but I change it a little every time. Hmm I guess that would be ok, you all will just get that day's hummus lol. Red pepper hummus would be something Id love to know how you make. These sliders look incredible. How could anyone resist these gems! Those are cute, love the idea. Yummy yummy as always! red pepper hummus with pita chips, I will be dreaming about that tonight after I finish this mojito that I am drinking. I can see why they disappeared so fast! They look wonderful; I love grilled veggies. I make my own hummus, too, but I've never put red pepper in it. I bet it's delish! I'll give up my man card for an hour ... I'm not one to make fun of something that looks that good. what do you think of these Tips for amateurs?? The mix of colors in these sliders is amazing! Great idea Laura. I think Steve would really like these - especially with the hummas. You should show me how you make yours. I'v heard homemade is the best! Steve is eating fresh tomatoes now?? Oh my goodness. I just had like five brownies so I'm thinking that it would be smart of me to have some of these. They're adorable and healthy-looking! I mean.. what isn't with veggies in it?